It is both delightful and refreshing when a theatrical production can still manage to take you by surprise. In a world filled with entertainment media in which everything seems uninspired and derivative, it’s not often that you have the opportunity to: #1, see a great, well-crafted new piece of theatre (or one that’s new to you); and #2, see one that doesn’t come off as a total re-hash of old work or just a sloppy mash-up of several, disguised as original. 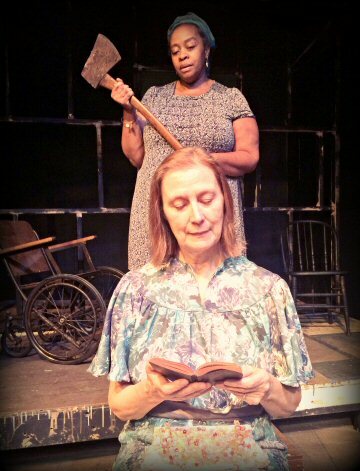 Those were the thoughts that were running through my head at the Suffield Players’ recent staging of The Sugar Witch, a creepy Southern Gothic drama by American playwright Nathan Sanders. But don’t expect this sugar to be sweet – The Sugar Witch, with its magic potions and curses, madness, mysticism, and mayhem, is altogether beguiling, but it’s also chilling, sinister, and completely bizarre at times. From beginning to end, this truly unexpected piece is packed with pretzel-like twists and turns. With its brilliant direction, stellar scenic design, excellent special effects, and outstanding acting talent, it will get your heart-pounding while you hang at the edge of your seat. Despite its setting noted as present day, as The Sugar Witch unfolds it feels like the action takes place in a different era – a time when no one walked around with cell phones glued to their palms; when daily doings went along at a far slower pace; and when family mattered and people were kind, except, well, when they weren’t. At the dilapidated Bean family homestead, we meet the last living descendants of the founders of the remote town of Sugar Bean – and from the start we know something just ain’t quite right. The quirky collection of kin manages their existence under the curse of a Sugar Witch in a home that abuts a Florida swamp where spirits regularly roam. 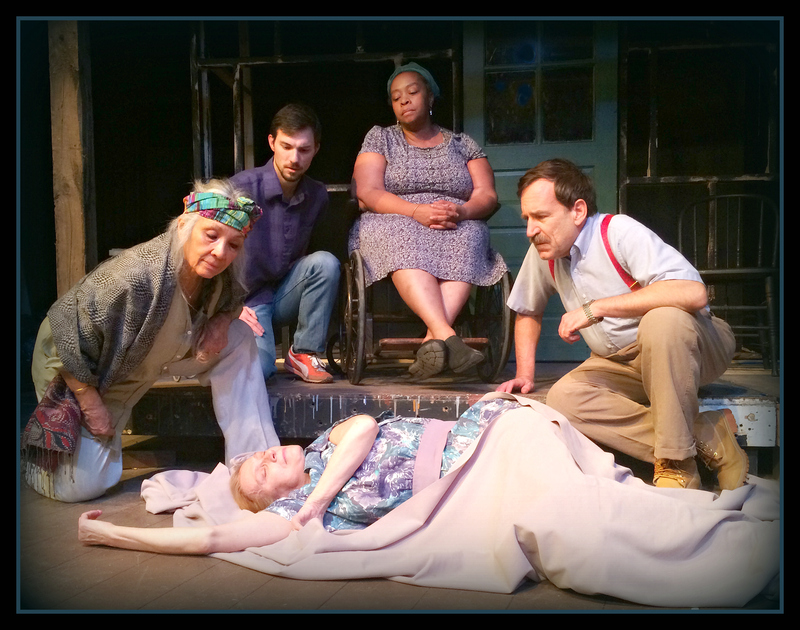 There’s Moses, an auto mechanic and much younger brother to the wheelchair-bound, Little Debbie-loving Sissa; and Annabelle, the last surviving Sugar Witch and long-time caregiver to the siblings. With a name like Sugar Bean, it surely sounds like a lovely place to live but paradoxically, it is riddled with darkness and deeply-buried secrets. It is on this fateful night when all is revealed and every dreadful skeleton is thrust from the closet. 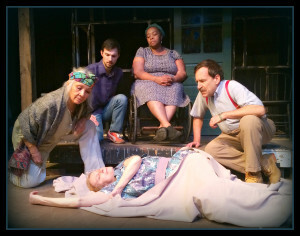 The peculiar and altogether “mad” Sisser sits alone on the porch when a cloyingly revolting Ruth Ann Meeks, a regular at the garage where Moses works, trots over in her Sunday finest in search of a little man action. When Sisser informs her that her brother isn’t home, Ruth Ann sets off in a huff, but that won’t be the last we’ll see of this catty repartee. The claws on these two grow sharper – like the claws of the mysterious flying felines which fill the Sugar Bean skies. When Moses returns, he announces to Sisser and Annabelle that he’s invited a guest for dinner – Hank Hartley, another frequent visitor to the garage. This is not to be a typical evening. Blood spattered walls, dead bodies, and chanting over the fire can’t right all the wrongs that have happened at the Bean home, past or present. It all goes from bad to worse when Granddaddy Meeks – think Klansman without the hood and every bit as mean – shows up at the homestead looking for Ruth Ann and threatening everyone. Now I’ve alluded to enough of the story without (hopefully) requiring a spoiler alert notification. Suffice it to say, anything goes in Sanders’ Sugar Bean. The Sugar Witch may pack in everything including the kitchen sink (in addition to heavy social themes of racism and homosexuality) but it works to perfection. Konrad Rogowski does an outstanding job bringing the rich text to life and he’s got some remarkable players to make that happen. Barbara Cortez-Greig is a delight as the mystical Annabelle; Dorrie Mitchell is the one you love to hate as the ruthless Ruth Ann Meeks; Mark Proulx is warmly compassionate as Hank Hartley; Elizabeth C. Reynolds is as odd as she is unnerving at times as Sisser; Danny Viets delivers an impressive performance as Moses Bean; and Eric Woodsides is as hateful as his granddaughter in the role of Grandaddy Meeks. It is a seamless execution – staged on an incredible set which is like a character in itself, designed by Rogowski and perfectly constructed by his team which must receive kudos here: Sharon Bruno, Art Christian, Jason Fregeau, Shaun O’Keefe, Dorrie Mitchell, Mark Proulx, Konrad Rogowski, Dana T. Ring, Kelly Seip, Bob Williams, and Jerry Zalewski. Shout-outs also to Bob Williams as Stage Manager and Heather Frew as Assistant Stage Manager; to Jerry Zalewski as Technical Director; Ken Hebert as Composer & Sound Designer; Patricia McMahon as Wardrobe Mistress; Jerry Zalewski as Lighting Designer and his crew, Nicole Migliozzi and Kelly Strouse; and Jason Fregeau as Sound Operator. Suffield never, ever disappoints and the powers-that-be have made a bold and brilliant choice with Sanders’ peculiar, powerful and thought-provoking work. It’s one you won’t want to miss! 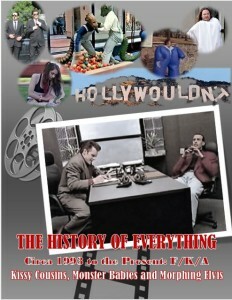 Since its inception, Pillow Talking has published over 200 reviews of theatre. 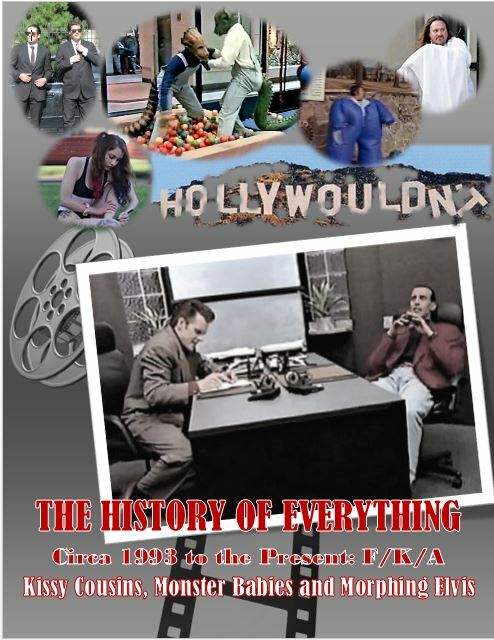 We’ve seen everything from world premieres, pre-Broadway shows, revivals, and even sequels. There is a tendency for rights to be both cyclical and concurrent so that it is highly possible to see West Side Story two or even three different versions during a season. It is almost impossible to find (unless it is a premiere) a gem of a play that is unique, different and haunting – and one that has been around and even in the Samuel French catalog for the asking. 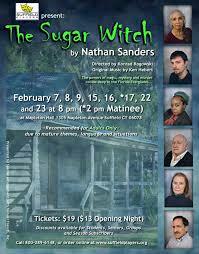 The play is The Sugar Witch by Nathan Sanders. 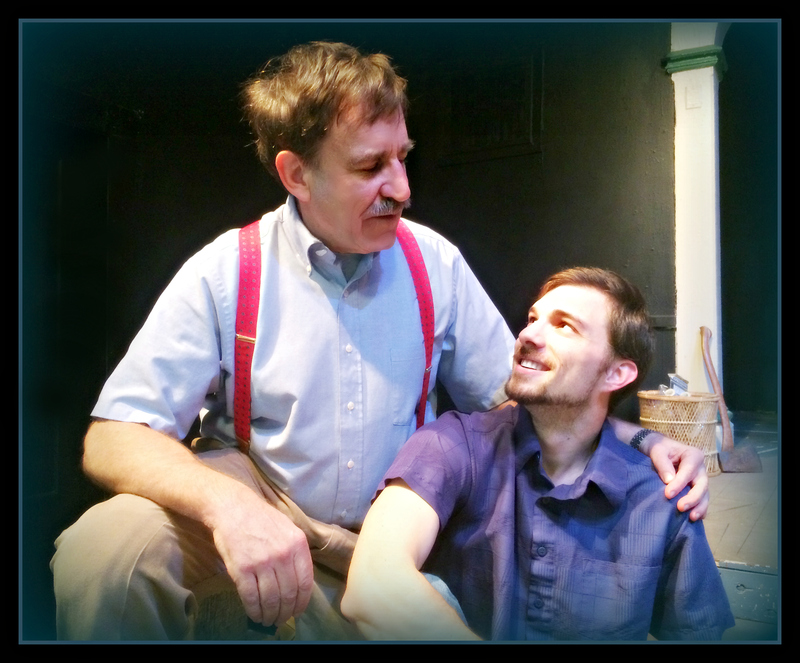 The work was chosen and performed by the Suffield Players, a community theatre group that is always creative, eclectic, engaging, and professional. As the Director, Konrad Rogowski, says in about the shortest note section of a program I have ever read, “To tell you more would be to tell too much.” In order to understand and fully appreciate all of the nuances of The Sugar Witch, it must be experienced – and even then, there are puzzle pieces which will haunt you long after the curtain comes down. Despite the mysticism, the magical, the quirky characters, flying cats (you just have to see it), at the heart of the play are the basic elements of our humanity: compassion, forgiveness, love, and innocence, set within the eternal battle between good and evil. See this diamond in the rough while you can. To say anymore would be to say too much. Oh my goodness, what a wonderful, thoughtful review of our play in Suffield. Thank you both so much for your support and kind words, Stephanie and Wayne! We are always honored to have you join us at The Players!